Wine is the lifeblood of the Italian people. Vines grow all over, and no traditional dinner in Italy can possibly occur without a bottle of wine on the table. Italy also has by far more different grape varieties than any other country in the world — over 1,000, with at least 440 presently used for making wines. The downside to wine’s penetration into Italian culture is that Italians often take wine for granted. Italy took 28 years longer than France to develop a wine classification system, for example; and today, more than 50 years after creating that system, Italy has yet to adequately incorporate official recognition of her best vineyard sites (crus) into her wine laws, as the French have done in Burgundy. Another handicap of Italian wines, for wine drinkers in other countries who want to learn about them, is that most Italian wines are made from native grape varieties that don’t exist elsewhere (and when transplanted, don’t perform nearly as well as in Italy). Grapes such as Nebbiolo, Sangiovese, Aglianico, and Barbera, to name just a few, can make outstanding wine in Italy, but their names are not household words outside of Italy, despite the fact that recognition of Italian wines has grown amazingly over the past three decades. Check here to find a table listing the grape varieties behind some wines of Italy’s most important wine regions. On the upside, Italy is blessed with such a variety of soils and climates — from Alpine foothills in the north to Mediterranean coastlines — that the range of its wines is almost endless. (A curious wine lover could keep busy for many decades, exploring all of the wines in Italy!) Italy’s hilly landscape provides plenty of high-altitude relief for grapevines, even in the warm south. One of the best-known Italian wines in the first category is Pinot Grigio, the ubiquitous dry white wine that has become the largest-selling type of imported wine in the United States. In the second category is Barolo, one of the world’s greatest red wines, along with many other fine Italian wines. DOCG (Denominazione di Origine Controllata e Garantita) wines, translated as “regulated and guaranteed place-name,” are a group of elite wines. The long Italian phrase corresponding to the initials DOCG appears on the labels of these wines. DOC (Denominazione di Origine Controllata or, in the new E.U. lingo, Denominazione di Origine Protetta, DOP) wines, translated as “regulated (or protected) place-name,” are Italy’s basic PDO wines. The phrase Denominazione di Origine Controllata (or Protetta) appears on the labels of these wines. The terms DOC and DOCG refer both to wine zones and to the wines of those zones. The DOC Soave, for example, is both a place (a specific production zone defined and regulated by Italian law, named after a town called Soave) and the wine of that place. In the lower E.U. tier — wines with a Protected Geographic Indication (PGI) — Italy has another category of wine: IGT (Indicazione Geografica Tipica or, in the new E.U. lingo, Indicazione Geografica Protetta, IGP) wines. These wines have a geographic name on the label, but that name represents a broader territory than that of DOC/DOCG (DOP) wines. For example, although the DOCG wine Brunello di Montalcino must derive from grapes grown in a very specific section of the region of Tuscany, a wine with the IGT/IGP name of “Tuscany” may come from anywhere in that whole region. Many IGT/IGP wines carry a grape variety name in addition to the name of the protected geographic area. 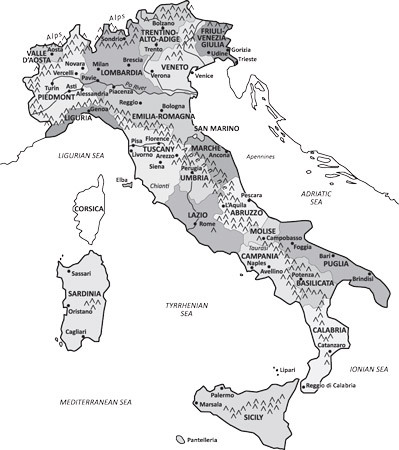 Italy is said to have 20 wine regions, which correspond exactly to her political regions. In other words, wine is produced everywhere in Italy. What is called a wine region in France, such as Burgundy or Alsace, is referred to here as a wine zone in Italy to avoid confusion with the political regions. The wine zones of Italy. Many of the finest wines come from the north: the Piedmont region in the northwest, Tuscany in north-central Italy, and the three regions (informally called the Tre Venezie) of northeastern Italy. But southern Italy also makes some fine wines that have become better known outside of Italy.